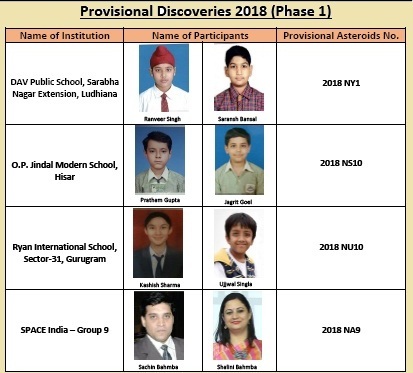 In 2018, four asteroids were discovered by Indians as part of an International science programme, ‘All India Asteroid Search Campaign’, conducted by SPACE India in collaboration with International Astronomical Search Collaboration (IASC), Hardin Simmons University, Texas, the United States of America. The discoveries have been confirmed by IASC and International Astronomical Union which records such discoveries. Since 2010, every year, Indian students participate in this asteroid search campaign. This year, around 400 students from all across the country participated in this 2-month long campaign to find asteroids. In this project, images are taken by the Pan Starrs telescope in Hawaii, which provides images to the participants. Students look for asteroids under programmes initiated by NASA and Jet Propulsion Lab that track and monitor asteroids looking for ones which may have perturbed out of their orbits and thus pose a threat to earth. The students use advanced software and techniques to look for asteroids.